Acts4Youth is off to a great start this year because of your commitment to help us lead the next generation to loving God, loving others and thriving in the classroom. During September at both Cardinal Shehan and Walter P. Carter schools where we are working with a total of 400 students in 4th through 8th grades, we covered the topic of the brain and how the different sections serve different functions that help manage our emotions. It is all to reaffirm the power we have in disciplining ourselves in the virtues that we set as the foundation of the class: self control, perseverance & endurance. 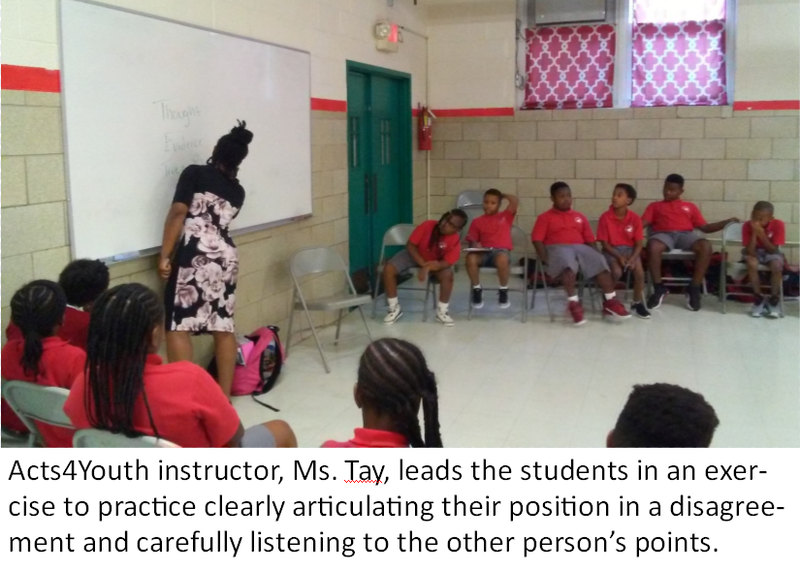 Tay Lee, our newest staff member and primary teacher of the Foundations classes taught in school, is delighted at the prospect of engaging the students with a spiritual foundation. Prior to joining Acts4Youth, Tay was a teacher, and she is currently completing her masters in social work. “I appreciate that Acts4Youth seeks to reach the whole child and not the half child…. Academics is half the battle…their emotional development is what is going to carry them everywhere and that is deeper than math and reading…” Being able to resolve conflict and work through emotions and directing the adolescent mind towards it is vital to the human experience. 1. Saturday retreats that include devotions, service project, and fun trip. 2. Monthly breakfasts for students and significant adults in their lives with messages geared toward celebrating godly manhood and womanhood. 3. Weekly 3D group athletic activities based on Fellowship of Christian Athletes’ template, including pre-activity devotionals. In addition, we will continue our weekly afterschool program with lessons celebrating becoming a Godly manhood and womanhood that have been the bedrock of Acts4Youth, one-on-one meetings with students during lunches, and summer retreats. 1. Every summer internship participant in 11th and 12th grades will be paired with a volunteer adult mentor. These mentors will help students fulfill their post-secondary plan, such as visiting colleges or trade schools, SAT prep, learning about careers, etc. 2. Our Saturday program will continue the social, emotional, spiritual training through the lens of developing a leadership attitude, including lessons about what it means to be a leader, developing your own leadership style, etc. Teens will create leadership goals for themselves and be held accountable for putting their goals into action by staff and volunteer mentors. They’ll also be examining the life of Christ to help them grow in their faith and leadership from a distinct Christian perspective. We are so grateful for the privilege you have given us. You have granted us with another year to see that the future generations of Baltimore kids are given the tools for success and the opportunity to know God. Prizes * food truck * dessert and drink with ticket. More info. and purchase tickets here. To help at-risk Baltimore City students become whole and thrive, you can make a donation at www.acts4youth.org.